Here are some of Tedi’s presentations and speaking engagements in 2010. 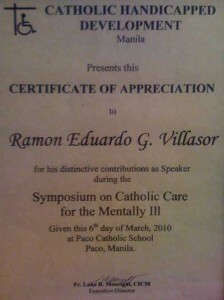 Last March 6, 2010, Dr. Villasor was invited by the Catholic Handicapped Development–headed by Fr. Luke R. Moortgat, CICM of De La Salle University–to be a guest speaker for their symposium on Catholic Care for the Mentally Ill.
Tedi’s talk, entitled “A Brief Look into Mental Illness”–briefly touched on several mental disorders such as anxiety disorders, mood disorders, psychotic disorders, personality disorders, eating disorders, addiction disorders, and poor impulse control. There was also an emphasis placed on educating patients, parents, counselors, teachers, and mental health professionals on the possible benefits of psychotherapy/counseling, medication, etc. The Philippine Mental Health Association (PMHA) Pangasinan-Dagupan City-San Carlos City Chapter has invited Tedi to be their resource speaker on the topic “Understanding Bullying: The Bully and the Bullied/Genes and Behavior: Fact or Fantasy?” It will be held on September 8, 2010 at the People’s Astrodome in Dagupan City.